NEW YORK (AP) -- Fred Claire can see the day when Major League Baseball teams open academies for prospects in Cuba. "It's absolutely a natural, just as the Dominican was and Venezuela. 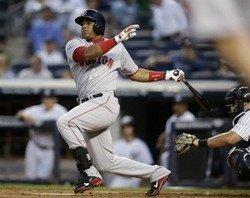 You go to where the talent is," the former Los Angeles Dodgers general manager said Wednesday. "The high talent level for Cuban players is still there." That talent has faced obstacles getting to the U.S. since 1961, when the United States terminated diplomatic relations with Cuba. President Barack Obama said Wednesday that the two nations were re-establishing relations. The path to the major leagues for Cuban players has often involved smugglers who bring them out of the island nation for a price. It's hard to foresee exactly how that will change in the short-term, or whether MLB teams will be allowed to invest resources in the communist country. "While there are not sufficient details to make a realistic evaluation, we will continue to track this significant issue, and we will keep our clubs informed if this different direction may impact the manner in which they conduct business on issues related to Cuba," MLB said in a statement. Twenty-five Cuban-born players appeared in the major leagues this year, a group that includes outfielders Yasiel Puig and Yoenis Cespedes, and hard-throwing reliever Aroldis Chapman. There have been 59 since 1995, according to STATS. Many have received large contracts, topped by a $72.5 million, seven-year agreement in August between outfielder Rusney Castillo and the Boston Red Sox. Chicago White Sox first baseman Jose Abreu was voted AL Rookie of the Year this season after agreeing to a $68 million, six-year deal with the Chicago White Sox. Yasmany Tomas, an outfielder who may be shifted to third base, signed $68.5 million, six-year contract with the Arizona Diamondbacks this month. Because of the American trade embargo, a player who defects from Cuba has to obtain a license from the U.S. Treasury Department's Office of Foreign Assets Control to "unblock" him before he can sign with a major league organization. It would take congressional action to lift the embargo. "We remain hopeful that today's announcement will lead to further positive developments," the Major League Baseball Players Association said in a statement. The Cuban government has approved a policy allowing athletes to sign in foreign leagues and pay tax on their earnings, but the U.S. embargo prevents American teams from employing Cuban residents. Well regarded outfielder Alfredo Despaigne agreed this year to a contract with the Chiba Lotte Marines of Japan's Pacific League. Defecting players have established residency outside the U.S. in order to become free agents and not be subject to MLB's amateur draft. But free-agent riches could come to an end in 2017, when MLB teams hope to start an international draft. Under MLB's collective bargaining agreement with the players' association that runs until December 2016, Cubans and others who reside outside the United States, Canada and Puerto Rico are included in each MLB team's international signing pool unless they are 23 or older and have played as a professional in a professional league for at least five seasons. Teams are penalized for exceeding their signing bonus pools. The New York Yankees, Boston and Tampa Bay have forfeited their rights to give any international player a bonus over $300,000 in the next two signing years, which start each July 2. MLB and the union instituted similar signing pools in 2012 for players covered by the amateur draft each June. But Cuban defectors remain exempt from those limits for now. "Frankly, American players, many of them have a lesser standard than what's offered international players," said agent Scott Boras, who has criticized restraints on contracts for players in American high schools and colleges. "We've really got to review what we're doing with our draft and our international players to really say what we do with the Cubans. Maybe it will prompt a broader discussion to revamp the entirety of the system."